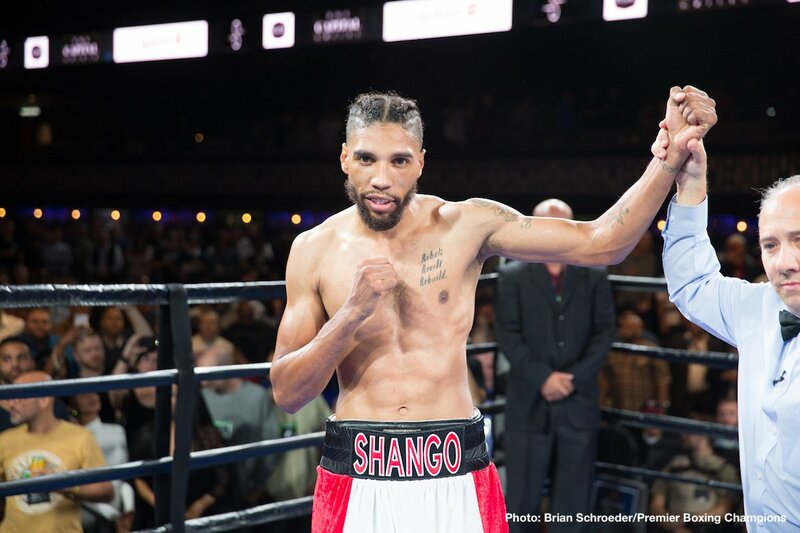 Welterweight contender Jamal James (24-1, 11 KOs)gave his hometown crowd a treat as he sent Mahonry Montes (35-8-1, 24 KOs)to the canvas for a second round knockout in the main event of a jam-packed three-hour night of Premier Boxing Champions action Friday fromthe Armory in Minneapolis, Minnesota. In his second straight fight at the Armory, James made a statement by quickly dispatching Mexico’s Montes with a punishing left hook to the body that left his opponent crumpled on the canvas. In the co-main event, middleweight contender Willie Monroe Jr. (23-3, 6 KOs)showed off his boxing skill and picked apart Javier Francisco Maciel (33-7, 23 KOs)to score unanimous decision in their 10-round bout. Monroe was dominant with his jab, movement and an array of offensive attacks. He was able to vary his punches enough to keep the aggressive Maciel from landing anything that caused damage. Maciel looked to score with power punches and body shots, but the former title challenger Monroe was comfortable on the outside and mixing it up inside on his way to winning the fight by scores of 99-91 and 100-90 twice. The opening bout of the telecast featured fast-rising prospect and 2016 Lithuanian Olympian Eimantas Stanionis (7-0, 5 KOs) as he earned a unanimous decision over Levan Ghvamichava (18-4-1, 13 KOs)in their eight-round welterweight matchup. Stanionis rode a powerful jab and sharp combination punching to the dominant victory as he faced the toughest opposition of his pro career to date. Ghvamichava was game and tried to counter the hard-charging Stanionis but was too often taking the worst of exchanges on the inside. At the end of the action all three judges saw the bout in favor of Stanionis by scores of 80-72 and 79-73 twice. Additional action saw Jeison Rosario (16-1-1, 11 KOs) score a unanimous decision over Jamontay Clark (13-1, 7 KOs) in their 10-round super welterweight bout. Rosario scored a highlight reel knockdown with a counter right hand in the third round that saw Clark tumble out of the ring. Clark was able to return to the ring and beat the count, but he took more damage throughout the bout before losing the decision by scores of 99-90, 98-91 and 97-92, all in favor of Rosario. A scheduled heavyweight bout ended in shocking fashion before it ever began, as heavyweight prospect Efe Ajagba (6-0, 5 KOs) was awarded a victory by disqualification against Curtis Harper (13-6, 9 KOs) when Harper exited the ring moments after the opening bell rang, opting not to face Ajagba. Prelims on FS1 and FOX Deportes saw rising super welterweight prospect Sebastian Fundora (10-0, 6 KOs) stop Antonio Urista (10-3, 2 KOs)at 2:22 of the fourth round, undefeated super welterweight Leon Lawson (8-0, 4 KOs) win a unanimous decision over Brandon Adams (4-7-1, 2 KOs) in their six-round fight and unbeaten prospect Gary Antonio Russell (12-0,10 KOs) score a first round knockout of Nick Otieno (31-15, 13 KOs) just 1:18 into the round.